Lobster tarts from Timothy S. Hopkins Catering, colorful bites from Tastebuds Gourmet Foods and an array of treats from The Topsfield Bakeshop. 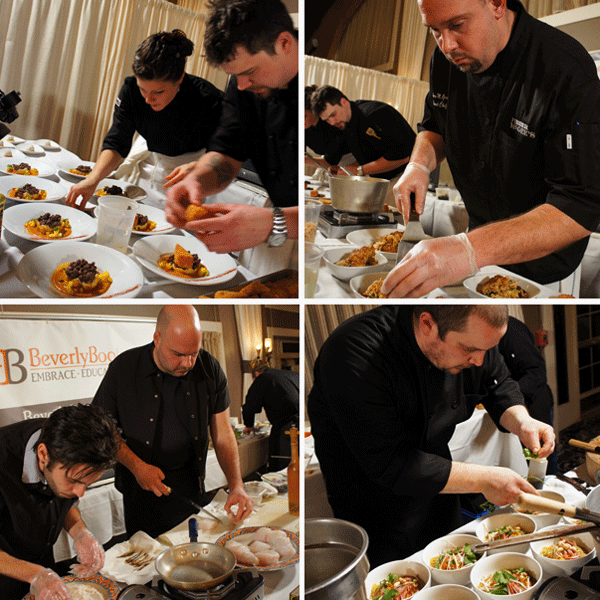 It was a great night for a great cause—we thoroughly enjoyed ourselves at Monday night’s Best Chef 2013 event to benefit Beverly Bootstraps. We started by perusing the gorgeous silent auction items, then made our way around to each of the food offerings from various North Shore purveyors, caterers, and restaurants. One of favorite tables, Timothy S. Hopkins Catering, ended up winning the people’s choice award. We loved their tiny lobster pastries and delicious toffee-chocolate mousse cups. The variety on offer was terrific, including smoked mahi ceviche shooters from Red Lulu, healthy grain dishes from Life Alive, and seared tuna on crispy tortillas from Not Your Average Joe’s. There was plenty of food, too, allowing us to go back for seconds and thirds of our favorites. The teams hard at work. Clockwise from top left: Alchemy Cafe and Bistro, Fibber McGee’s, Christopher’s Table and Chianti Tuscan Restaurant & Jazz Lounge. As the four chefs competing for Best Chef title prepared their entrées, the live auction got going, with much fanfare. The entire event was extremely well thought out and ran smoothly from start to finish. The Best Chef contestants were Christopher’s Table (Ipswich), Fibber McGees (Beverly), Alchemy Cafe and Bistro (Gloucester) and Chianti Tuscan Restaurant (Beverly). Top: The judges taste and compare notes. Bottom: The winning dish from Christopher’s Table. The contestants used ingredients from the Beverly Bootstraps pantry as 75% of their ingredients, with 25% coming from their own kitchens. They were judged on taste, appearance, and the originality of the use of pantry items by Eliana Hussain of the Cambridge School of Culinary Arts, Sam Hunt of Wild Horse Café, and Paul Guanci of Super Sub Shop of Beverly. The chef’s creations were wildly imaginative, including goldfish-encrusted spam cooked sous vide from Alchemy and a chicken pot pie with crust made from pumpkin bread mix and Bisquick. 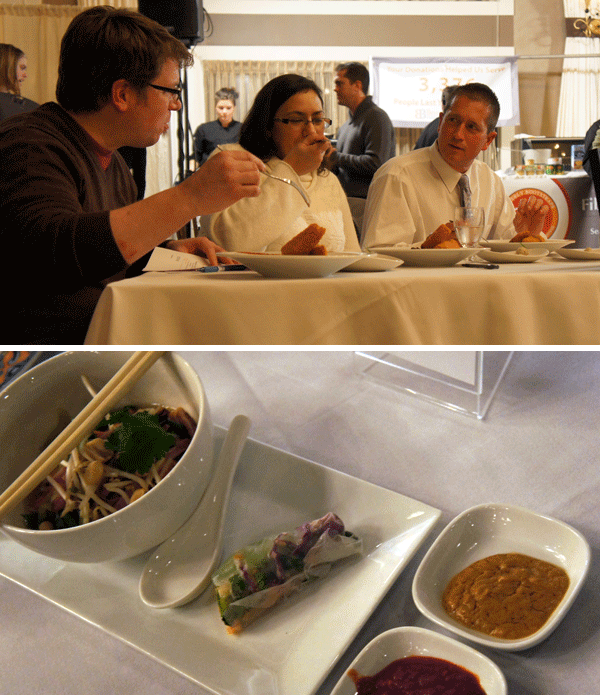 But the beautifully plated pho from Christopher’s Table was the judge’s winner. It featured ramen noodles in a broth flavored with peanuts, cilantro, and lime, plus a spring roll accompanied by a hoisin sauce made with grape jelly. A good time was had by all. (L) Lindsey Sakonchick, Development/Marketing Coordinator for Beverly Bootstraps had everything under control. (Center) Matt Blanchard, new owner/manager of the Wild Horse Café and Mark McDonough, owner of Serenitee Restaurant Group are old friends. (R) Blanchard’s Wild Horse partner and 2012 Best Chef winner, chef Sam Hunt chats with Christopher DeStephano, this year’s winner, as he preps his meal. 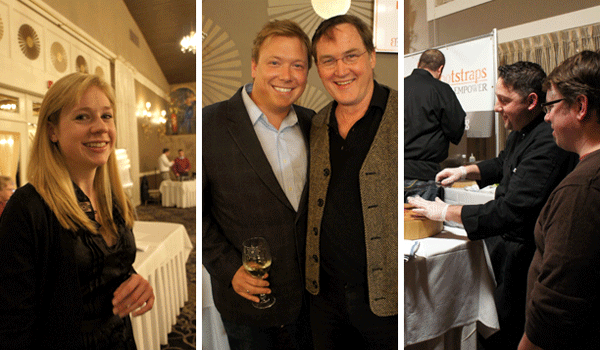 It was such a pleasure to see the North Shore turn out for this sold-out, fun-filled event! There’s something very hard to resist about a glass of good wine and food that pairs perfectly with it. That’s the idea behind the newly launched wine bar at Christopher’s Table in Ipswich. By day, the space is a bakery café featuring gourmet sandwiches like turkey with caramelized onions, bacon, tomato, and fresh greens and a treats like cupcakes, brownies, cinnamon rolls, and apple turnovers. At night, white tablecloths and thoughtful lighting transform this spot into an intimate wine bar. Diminutive sofas, red and gray décor to bring out the space’s tin ceiling, and comfortable bar stools are part of the charm created by North Shore designer Lisa Kawski of LMK Interiors. 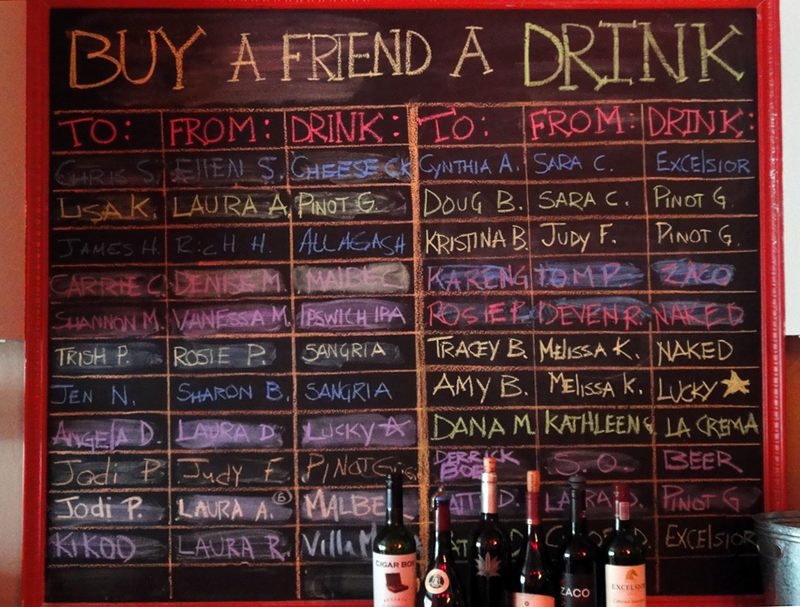 Behind the bar is an idea we love: a chalkboard encouraging friends to buy drinks for each other. The drink special the night we visited was a peach bellini, but we went with the flavorful pinot noir ($10). The crispy fried chickpeas are just about the perfect bar snack ($6), and the arancini were a lusciously cheesy ($10). We didn’t try the cheese or charcutrie plates, but we saw them nearby, and they looked delicious. 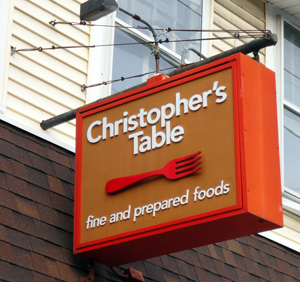 Chef/owner Christopher DeStefano says he is planning to add comfort food items to the bar menu for fall. Chef Christopher is also looking to tap into foodies interested in classes. Upcoming events include a four-course dinner of local foods paired with four wines (Oct 15). His next class is on cooking with fall ingredients like pumpkin, apples, dried fruits, sage, and squash (Oct 24). Check the website for more information, and let us know what you think about the wine bar if you stop in.